Oop, back sooner than planned. I am having an Uh-Oh moment. Okay, more of a D'oh! moment. I was going on my merry way when I got cold feet. The pictures from the fitting showed a pretty thick look, and the front-most skirts (tabs) seemed useless, vestigial. Something that had escaped notice during the fitting itself. Another reason why pictures and taking your time are good things. Back it was to looking at real stays for help. Since I can't use pictures from POF5, we will look at examples from online museum collections. Here is a favorite pair of long stays. Other than lacking a full front opening and being for me scandalously low in the bustline, in all other respects they're just what I am looking for. The skirts (we call them tabs these days) aren't boned. They're floppy. Look at the boning pattern down around the hips. The skirts sit right along the pelvic line: marking it, showing it off. Each bone is set on an angle, so that, I hypothesize, the downward pressure is eased a little, and the bones slide a bit over the pelvis. Yes, yes, I am guessing here. Might the stays bite on the hips when the wearer sits? Or do those bits of fabric and the boning pattern ease the situation to bearable or better? Here is a pair from the Manchester Art Gallery in the UK (1947.1622). Well, the skirts, such as they are, are boned, and they don't splay, and they do not seem to demarcate the hip line: instead there is a curve. I suspect that the woman who wore these was slender. Now look at some later stays. Is hip-biting the reason why that in so many later stays the skirts are boned, and apparently heat-treated to splay out permanently, thus creating a seating on the hips with some spring to it, to mitigate any digging in? Look at these circa 1770s stays from the Met (C.I.40.173.6a–e). The skirts are a little wider and boned and the permanent splay is apparent. They appear to be made to sit on the hip line. The stays are covered in fashion fabric so the boning pattern is invisible, but the skirts are so stiff that I am sure they are boned. I've got to decide whether or not the skirts will follow the hip line closely or not. Do I risk discomfort and leave the skirts floppy, but obtain for sure a silhouette that nips the waist and elongates and slenderizes that line as much as possible? Or do I trust that heat-treating the bones will offer both a springy splay and a nicely nipped waistline that still offers that rigid line we have seen in the painted record? Obviously, the vestigial tabs are rather stupid -- I do have to figure that out. Yet there's more to it, naturally. 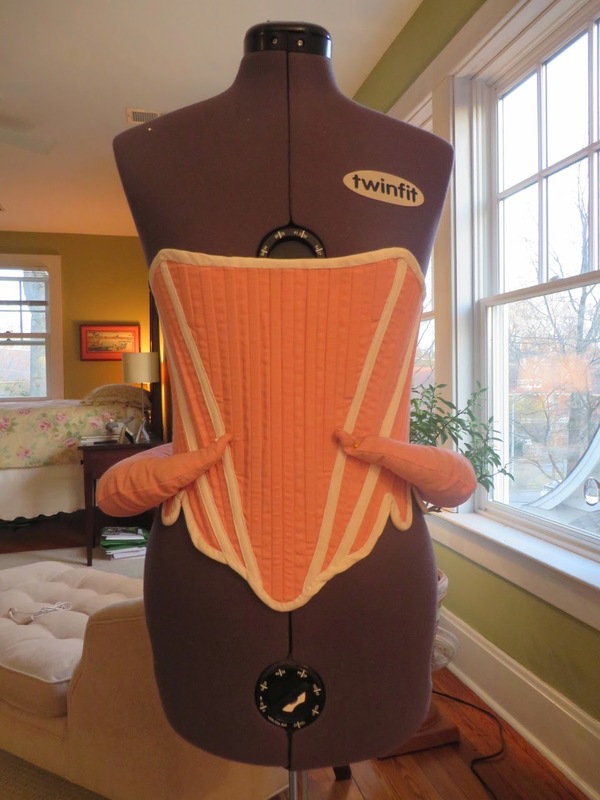 Here's the picture of the front at the first fitting. Yes, with a few tweaks I will make, the stays fit. No, they are not cinched in at all. So of course the cone shape is going to be rather thick. Yet it's hiding the hip line too much. The stays aren't getting the chance to demarcate the waist-to-hip break. While years of forced sedentaryness -- sedentarity?-- have added squishy padding that my age-modulated slower metabolism is finding it hard to banish (dang it! the gym's healthy but it isn't shrinking me very well), I do have a waist. The squoosh loves the arms, chest, hips, thighs and posterior section best. I have extra va-voom. Well, if I have it, why not let it show 18th century style as much as possible? The current setup isn't doing it. The waistline is hitting squooshy stuff, not the hip bone. The front skirts are just sitting there, not doing anything. That's because they're not following the hip line: they're below it. 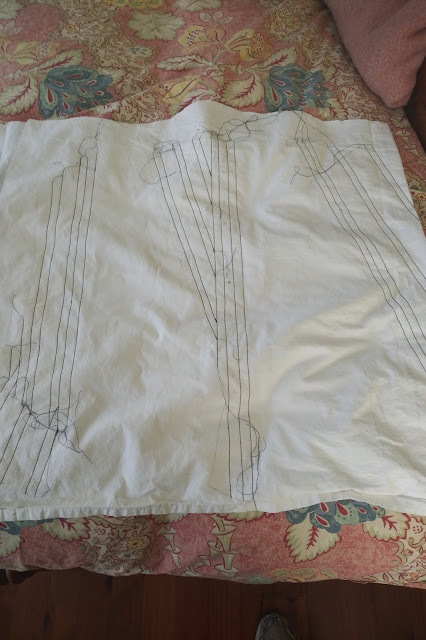 Until I sew that side seam lower, and risk tearing the mockup by cinching in the stays the way I want to wear them to regulate the squoosh, I won't know where to start the skirts, much less decide whether I want to bone them or not. Not my hair, not my hip. Heaven forbid -- you get old enough to know several people who have broken a hip, and you'll be skittish, to -- no, the stays, the stays. Flipping back through pictures, I found this from several years ago: my old stays, with hip pads sewn to them. Uh-huh. Fake hips go on the hips, not at the waistline. The pads are set too high, which scootches up the waistline, which nudges up the apron ties. That's one reason why in pictures I am short-waisted. The look would be a little better if I had set the pads lower. Live and learn. 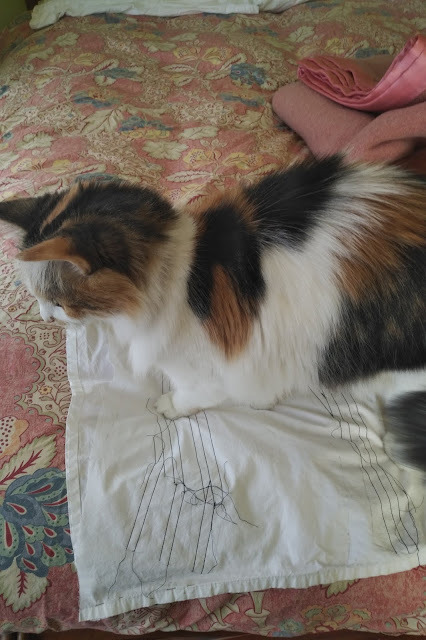 Nutmeg is ready to chase some lacing. I had to rescue the stays before we had a rat's nest. Was making a boned mockup important? Could I have cut a toile and tried that on? Yes, but...a soft toile just didn't seem sufficient. There was a lot to test out: besides a good fit, I want truly long stays and needed to see if I could sit in really long ones. Being able to sit down in a garment is pretty key. I wanted to test, too, how the bowing of the stomacher would look and how many rails to add. I wanted to have a long look at the overall silhouette: did it achieve the general lines of all those paintings we looked at in the last post? Making a full mockup wasn't my idea: I got it from Morgan Donner and her video about her 17th century stays mockup. So, I went ahead and took the time to make a bone mockup, spending perhaps 4 hours with getting the pattern on paper, maybe 5 or 6 sewing the channels, another five or six finishing the rest of it. Each of these steps in smaller chunks of time to fit it into Life (TM). That's significant time to spend on a mockup, but as I've seen by the results, it was really worth the effort. 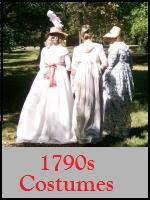 Here's the pattern again, the well-known 1740's stays from Norah Waugh. I don't have a printer handy, and didn't have the patience to transfer the design to full scale on gridded paper. So how did I do it? It's simple, if slightly scary, in that the measurements aren't exact. Copy the design right on your computer screen. Here's how I did it. Enlarge the picture on your computer screen until the ruler printed on the corner of the pattern matches a real ruler held up to it. Place a sheet of bond paper over the screen. Gently trace through the paper. When you run out of paper, remember roughly where you were, put up another sheet of paper, or shift the image on the screen, and keep going. Tape everything together when you're done, overlapping the paper pieces where you traced anything twice, until everything lines up. Once I had the pattern traced, I cut the pieces out, taped them together, and tried them on to see how they fit. The resulting stays were just a bit too small. So I did the same thing again, but enlarged the screen until the pattern ruler was just a wee larger than the real one. Are there potential problems with enlarging the entire pattern until it's larger than life size? Yes, but in this case the change was very slight, and I hoped to have less enlarging to do during the fitting. You see, I had very -- very -- roughly measured the distance around the original pieces onscreen and estimated them to sort of fit a medium-sized person. I used an old cotton sheet for the fabric pieces because it's non-stretchy, fairly strong, and reuses a sheet too worn to be slept on. I cut the pattern with huge seam allowances so I could expand the stays as needed. Then using Sanna of Rococo Atelier's tutorial for speedy stays for instructions on sewing the mockup, I put everything together. Because there are so many tutorials available, we'll go through this part quickly. After drawing the stays pieces on the fabric, I sewed the the outlines of the stays and made boning channels enough to stiffen the stays. By the way, part of the time I used a 1911 Willcox and Gibbs chainstitch treadle sewing machine to do the stitching. For fun, here's a shot of it at work. For ease in working, I placed multiple pieces of the stays per square of fabric -- it was simply easier to keep track of the fabric that way. 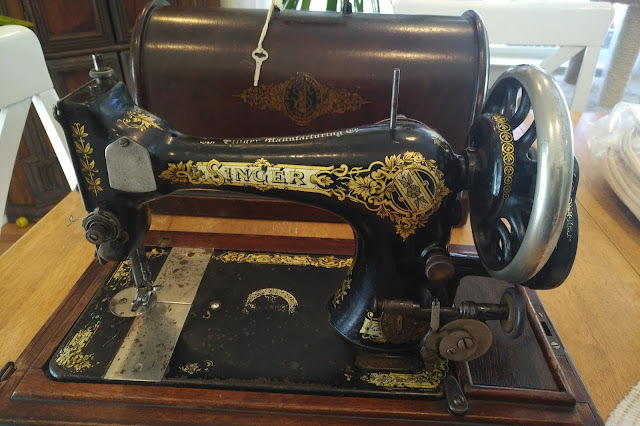 Somewhere along the line I changed out the sewing machine to the portable Singer 27 handcrank sewing machine. 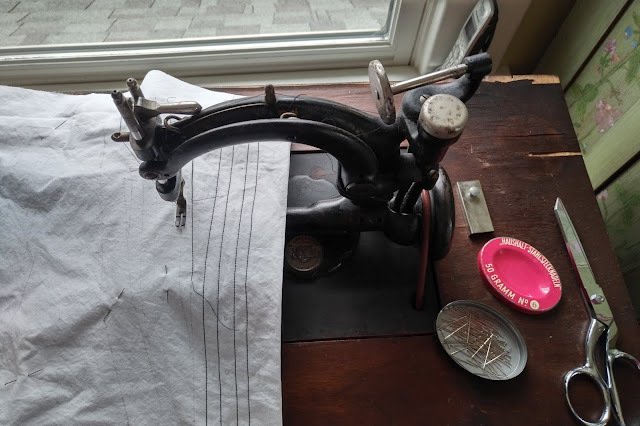 A chainstitch machine makes gorgeous, precise stitches, but chain stitches are built of a single thread, and when I was snipping around, I'd cut a thread accidentally, and oop, the seam would start coming undone. Lockstitches are better for this kind of work. Again, for fun, here is a view of the Singer. Oh dear, can't help it. 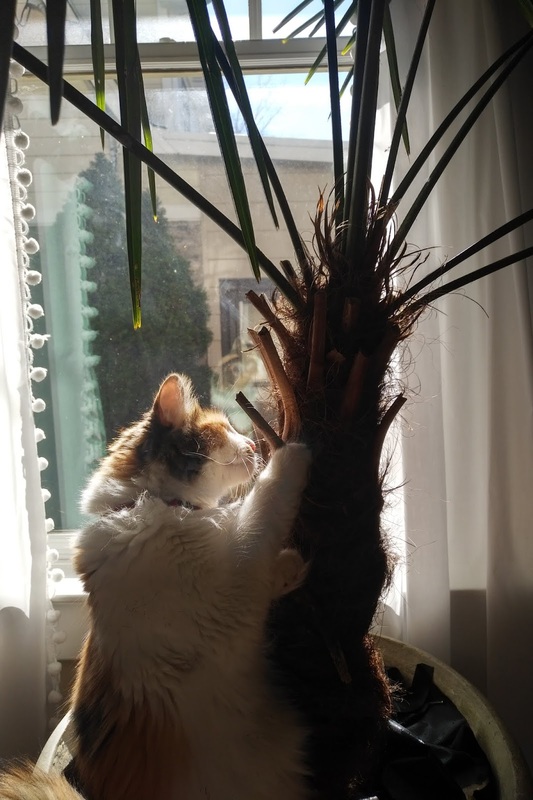 Nutmeg was just too cute sunning herself by stretching up on and nibbling one of our windmill palms, which we keep indoors in the winter. 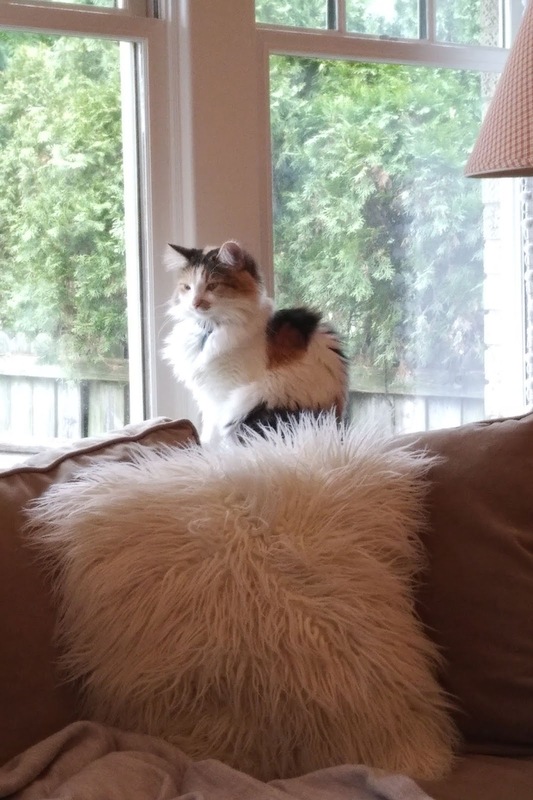 Alas, if you're going to read this blog, you're going to get too many kitty pictures. I used split cane for the mockup boning. Because it was so weak, each channel needed two pieces of cane. Here below are all the pieces were boned, including the stomacher. For some unknown reason I sewed the stomacher channels in a strong vee shape. Whatever. 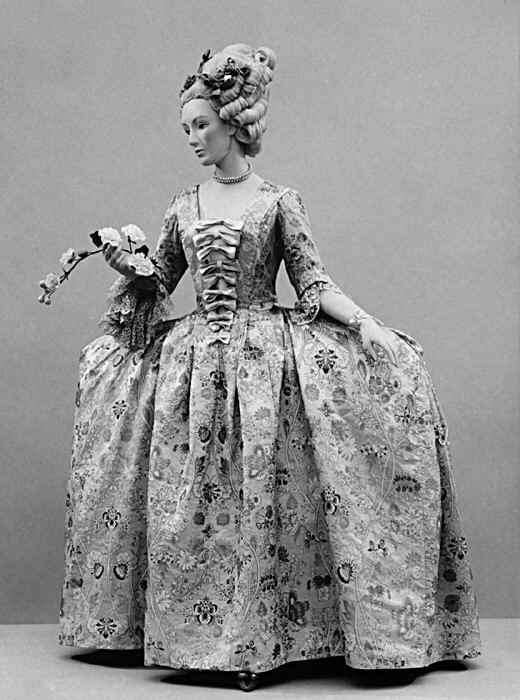 Note the three horizontal rails down from the top of the stomacher. Just as Sanna did, I fitted the boning in intersecting channels rather than adding extra fabric to the stomacher back for more channels. I'll need to do differently for the final pair because those rails need to be strong. Here below is how the rails curve the stomacher. 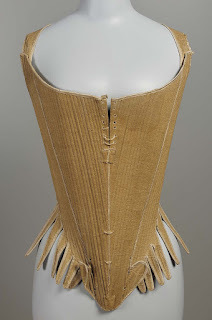 Imagine the curve that can be made right the way down the stomacher if more rails are added. Adding the eyelets to sheeting was harder than I thought it would be. Sheeting is made of closely woven thin threads, and the bone stiletto would not go through -- not without risking the stiletto tip. Had to start the eyelets with a giant needle. Eyelet making took a while, even though each eyelet was pretty casually constructed. I made a significant error, in that I offset the eyelets for spiral lacing the same on both sides of the back, when actually an eyelet should be offset at the top on one side, and at the bottom on the other. Have to correct that when making the final pair. For some reason the front opening's eyelets are not marked on the Waugh pattern as offset, but it didn't seem to affect the fitting. For the final pair, feel I should make offset outlets after all. It wouldn't do to have the fronts leaning crookedly. The boned mockup ready to lace, below. 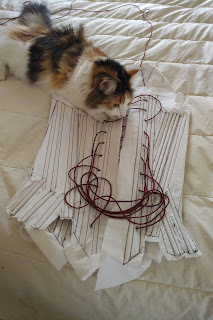 Nutmeg helped to control the lacing. She thought it was a useful job, and one she's suited for. I did not lace the stays mockup nearly as firmly as I will the final pair. First, I wasn't sure the cane and sheeting would hold up. Second, I wanted to see how the fit would be when the stays were laced semi-loosely. Unexpectedly, the mockup mostly fit. The top of the stomacher is too high not because it was cut that way, but because I left the caning pieces too long. Easy fix. 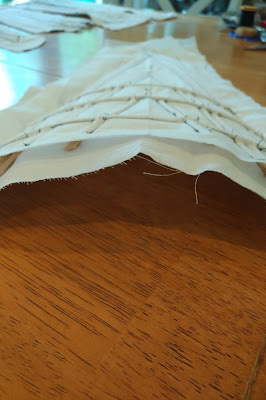 The stomacher lacing starts too high up on the side front pieces: I will move the top eyelets almost an inch down. the side front, because the straps will be laced shut with ribbons. If you look at the front peak, or bottom point, you will see that it sits very low on the torso. I sat down on a low, cushioned chair, and found sitting fine. Sitting did not push the stays up, something I worried would occur. The rise from the front point to the high hip is acute enough that the stays do not dig in anywhere. I need just barely a little bit of extra fabric between the side front and the side back, just towards the bottom, so I can sew them further down towards the bottom and increase the shaping. There is plenty of room under the arms, but the side front comes back far enough that none of the bust squooshes out. Look at the top of the stomacher and see the outward bowing there. I want to retain that. Am working out what material to make the rails of. 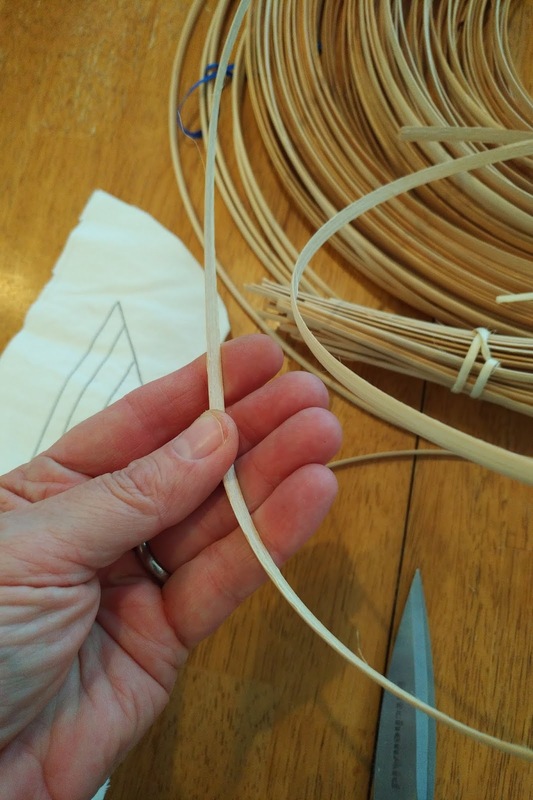 The current plan is to bend some pieces from hangers into shape and bind them to German plastic boning that has been already shaped using heat. Or I might use German boning only and reshape the curve when body heat distorts it. Look at the lower part of the stays' front and see how there is a tiny bit of curving outwards. When I build in small reinforcing layers of buckram, and add the small, trowel-shaped point in wood, and add the busk, that line -- I really hope -- is going to flatten out. The backs were laced loosely, with about a 2" gap. You can see, again, where there needs to be a little more boned fabric at the lower side so that the side seam can be sewn further down. I will not add much space, just a half inch, maybe, to preserve the nipped waistline. 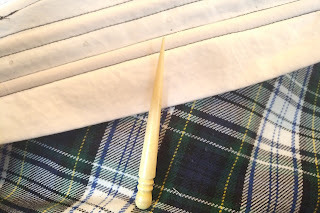 I will also sew that area with doubled linen thread because the stays will take a lot of strain there. You can feel the pull on the mockup. It's rather obvious that this is an area where there'd be strain, but I'd not have thought of it if I hadn't made a mockup. Oog, not a good picture, in so many ways. However, it does show the stays' fit. Thus ended the fitting and that's where we stand for now. I have a good deal of Lana and Nina's fleece to sort and get to the fiber mill, the boat needs to go from storage at the farm to our garage here at the house, and Easter is coming, with visiting family. It'll be a bit before we say hello again. Meantime, a very happy spring -- or fall, if you're in that dreamy spot, New Zealand! The type of look I am planning to emulate. 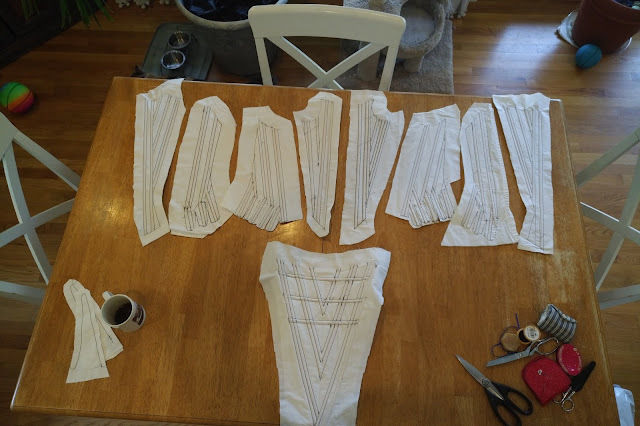 Longing for some years for a longer-waisted 18th century silhouette suited to 1740s-1760s half-dress wear, this January I finally found the gumption to attempt a pair of stays to create the look. Stays weren't something I wanted to make, particularly. 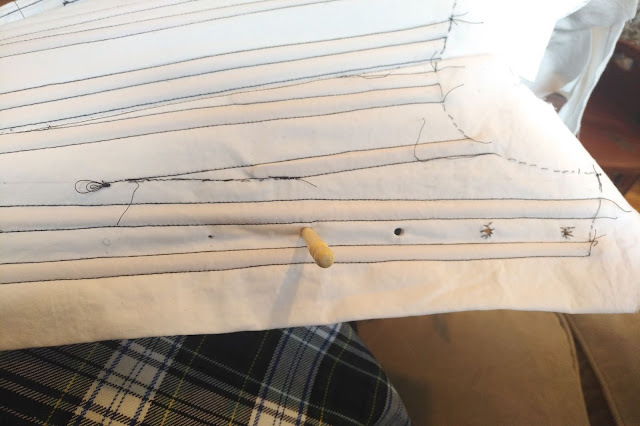 The local landfill now hides an aborted pair of 1790s stays, and I was never wholly happy with a pair of hand-sewn 1790s transition stays I spent a whole season hunched over and that bear specks of blood yet where a needle went AWOL mid back stitch and bit me more than a couple of times. Yet plumbing Etsy, Ebay, and everywhere else of an evening -- okay, lots of evenings :) -- looking for a pair to purchase with the proper styling, turned up nothing in my range. There aren't that many pre-1760 18th century stays out there to begin with. It was either make them or remain restless and fidgety with what I have. Frankly, in the time I spent browsing, I could have made a couple of mockups. Pfff. 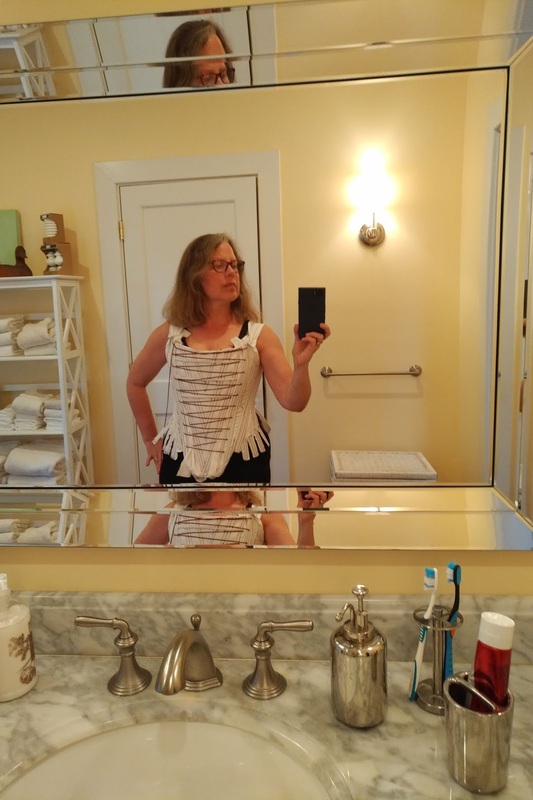 To write as Kitty Calash sometimes does in homage to early heroines: Reader, I was afraid. frequent packing of paper, cardboard, and buckram into the front to build out the bowing, especially towards that bottom peak. It's an unforgiving, stiff, and entirely artificial look. As if a lady were a ship's figurehead and her stays an oaken prow on the charms of which her admirers were dashed aside like an ocean wave. The plunge had to be taken: I am making such a pair of stays, whether they succeed or fail. The way we tend to do these days, what with so many museum collections online, I disappeared down a deep rabbit hole repeatedly, looking at portraits of roughly the middle third of the century and saving them, with notes, to a swiftly growing Google Docs file. I won't bore you with it, as rereading it, I bored myself with the same revelations, still apparently revelatory four or five screens and iterations later. Well, yes I will. If boredom strikes, please roll your eyes and skip the mass of this post. A note: I'm perfectly aware that artistic conventions and the wishes of sitters to appear as close to sartorial ideals as possible affected the way painters portrayed their sitters in this era. Even so, I believe that painters would frequently portray fashion details in this era because they were parts of the accepted social world and because the little details were important to sitters' senses of themselves, whether for status and respectability, pride -- whether tamped down or allowed to flourish -- or other reasons that we don't know. As you will see, the outlines of the stay shapes that POF5 displays, have a great deal to do with the silhouette of the outfits the women are wearing. 1740s. The highly elongated line of the stays and thus the bodice is clear. The stays fronts are bowed out a little all the way down. It seems that the entire skirt dips in front so that it's tilted a bit, to ray out round the front peak, and make the wearer look even longer-waisted. Whether that's the artist's conceit or whether the skirts could be shorter in front and then rise along the waistline, I don't know. Do you see how the little stems of the posy she is wearing appears to be woven into what look like close-ranged stay laces? 1745. A mostly similar visual situation applies here as in image no. 1, but the steep vertical rise from the stays' front peak to the high hip is quite obvious, because we are seeing the woman's figure from an angle. The stays do appear to just barely shift outwards just at and below the waistline. 1750s. Stays delineate the end of the bodice. The front appears very flat, but long. Circa 1757. 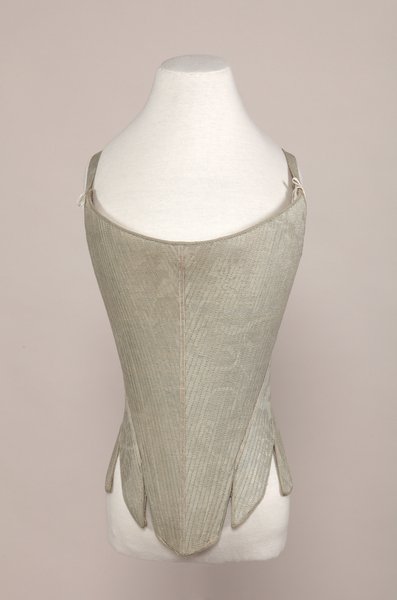 Very long stomacher, with bowing down the center all the way to the bottom of the stays. The stomacher does not curve out or flap out over the belly: it is clearly following the line of the stays. 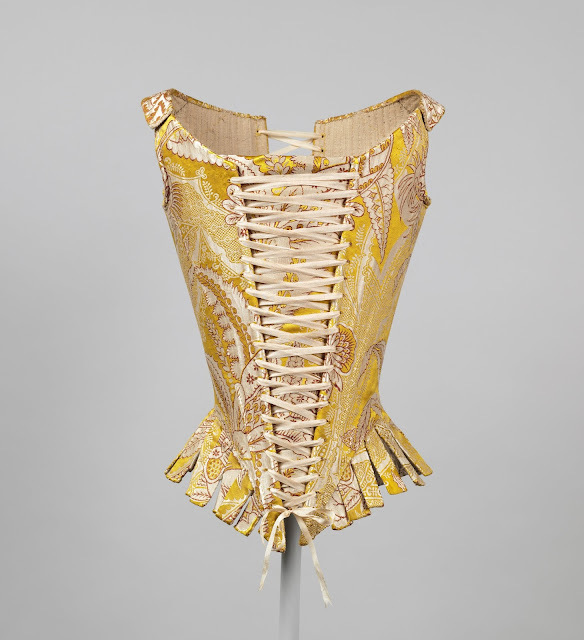 The gown robings are set quite far to each side of the stays, so that from the front the stomacher might have looked a bit wider than in the 1740s. 1763-4. While the overall line is not terribly long, and it's impossible to tell if the eldest child's stays are bowed down the front, her apron is clearly pulled down below the end of her stays/stomacher, to achieve a low end point, and there is no outward bending or flapping of her stomacher apparent. 1765. Again, a longish waist in stays and bodice in the case of Charlotte, Lady Huntingtower. The gown robings and stomacher are wider at the top and perhaps narrower at the bottom, for a more pronounced vee shape. There is a bit of an outward bowing down the front of the stays. The effect is still long-waisted, though less strongly so than in earlier decades. 1760s. Here the stomacher ends with the stays, and so do the robings. There is bowing across the stomacher all the way down. The line is still long, but less forcefully so. Here is Queen Charlotte from the 1760s. She may have been long-waisted to begin with, but again, the long line is emphasized -- it helps her look willowy -- but without the willow's tendency to sway! The stays fronts are shown relatively flat. The Queen's stomacher appears to slide a little -- a very little -- outwards at its base. This 1760s portrait of Madame Bergeret shows her wearing what I believe to be covered stays (stiff bodice), I would think, but it’s in the 1760s, and again, the line is long, with a bowed front all the way down, coming to a bit of a sharp edge in the center. 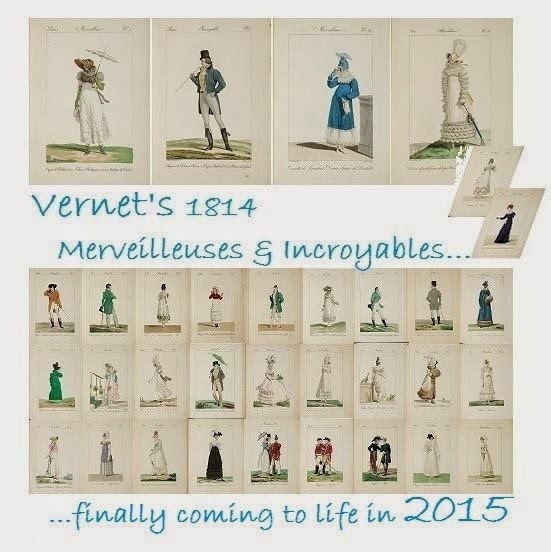 French and English fashions varied a bit, but it's still useful to look at more than just English works. 1771-2. It is difficult to see details, but I am pretty sure that the mother's stays are straight to the bottom and that the stomacher is not allowed to flap outwards much, if at all. Circa 1770s. Even then there are long-waisted, bowed front, high hip-rise looks. I rather think this is a formal fashion. Not all paintings and drawings show this particular fashion, but many do, especially among more fashionably attired women. As shown in the selection of paintings above, a long, rounded or sometimes flat torso appears to have been a fashion. Many of the bodice sections are so long in the front that room for the hips must be created by raising the line at the stay's sides acutely to the top of the hip. When painted in dresses that do this, women sometimes look nested down in their skirts. To emphasize length and narrowness further, the stomacher is narrow and acutely isosceles-shaped. The stomacher often, but not always, shows outwards bowing right the way to the bottom. The bowing can be a a gentle curve or even seem to have a bit of an edge at the center vertical line. Is that a painter's conceit or way of showing the bow front? By the way, if you examine the way the gowns are worn, it appears that the stomacher, pinned to the stays, and the stays, sit atop the top of the petticoat. We know that to be the case with covered stays, as in Madame Bergeret's portrait. This ensures that the long front bodice line is not interrupted. I suspect that the pinning must be very careful indeed so that the stays will not show to the sides or at the bottom of the stomacher. The stomacher can stop at the bottom of the robings, if robings are worn, or fall below them. An apron, if worn, may be pinned to the bottom of the stays so it dips and does not interrupt the line, or it can sit under the stays...it can be really hard to see details in the paintings. The petticoat may be cut to dip in front...although that is a subject for another time. We know from research that Hallie Larkin has done that aprons were cut in this away. Alas that her "Da Dip" post is no longer online! To attain the look, I must not only build a pair of stays with the characteristics listed at the post's beginning, but also make sure that any gowns and petticoats I make, are designed and put on carefully to achieve the look in the paintings above. What I most definitely do not want is the silhouette I displayed last fall while playing a shepherdess for Halloween. 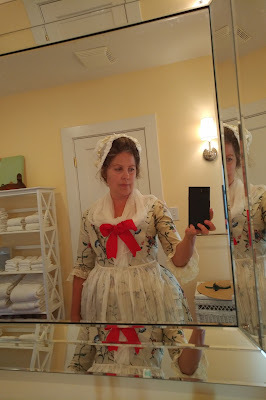 The stays under this dress are 1770s. They come just past my natural waist and the front doesn't cover the belly area too far. The dress built over them has a relatively natural, or even a slightly high, waistline. The crescent-shaped hip pads sewn to the sides of the stays are set just below the natural waist, and force the gown and petticoat out at a higher position than I'd like them to sit. The apron, tied over the top, sits at the natural waist and cuts the vertical line short. The effect is undress, as befits a shepherdess, but it's not, well, it's less slimming than it could be. I could, of course, have tied the apron under the stomacher, but the stomacher is simply a flat, lined piece of fabric. I don't think the visual effect would be lengthened much, if at all. Oddly enough, I didn't feel that any of the POF5 stays patterns were right for the project. Instead, I returned to the Norah Waugh's Corsets and Crinolines and her 1740s stays pattern. The picture below comes from Pinterest and has no attribution. The pattern has the requisite length, enough of a pinched waist and a relatively narrow front with a bowed stomacher, and it closes both front and back for greater ease in dressing. If you'd like to see some made by costumers, may I direct you to The Merry Thimble and to Isabel Northwode and Before the Automobile, of course. 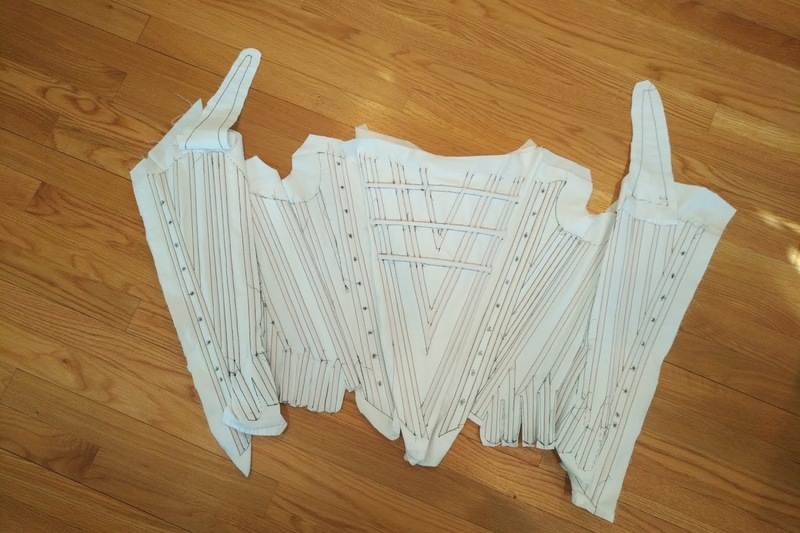 I have kept to the pattern itself in the main, but now that the initial fitting of a boned mockup is complete, I am making some changes to the pattern. All of the changes are in response to the stays shown in POF5. I am sorry not to be able to show pictures from the book, but surely that is understandable. I must make the straps sit further out, and more horizontally, more like court stays. This way the straps will not show in the neckline area. I will round the bottom peak (point) a wee bit so that it better matches the bottoms of stomachers, which are usually rounded. I will add two small wings (see below for photo), one to either side of the point, reinforced with buckram. They will, I hope, hold the petticoat inside, while allowing the point of the stays to sit outside the petticoat. Several 18th century stays in POF5 include them and I think they are useful. Add a pocket for a stomacher bust to go from the top rail almost to the bottom. The busk suppresses the belly and reinforces the stomacher to enhance its vertical line. Increase the curve of the horizontal rails as they near the bottom of the stays. In the bottom fourth of fifth of the stays, add multiple layers of buckram to strengthen the area. In the peak itself, add a balsa or paper-mache piece that holds the shape. Again, there are stays in POF5 that do so. Wrap all skirts (tabs) except the front two in leather rather than bind them. They won't be seen and will be stronger so. Again, per POF5. Here is a pair of late stays with little wings to the side of the front peak. I do not know the provenance: the picture was posted in LiveJournal (https://corsetmakers.livejournal.com/2174560.html). Note the very long, lean, straight line. Exactly what I am going for. I did look at 18th century ensembles as mounted in exhibitions, but on the whole, did not find that the effects mirrored the straight-lined stays we have been looking at, and so, I did not spend an inordinate amount of time on them. Here are three examples. The line is long and relatively narrow. 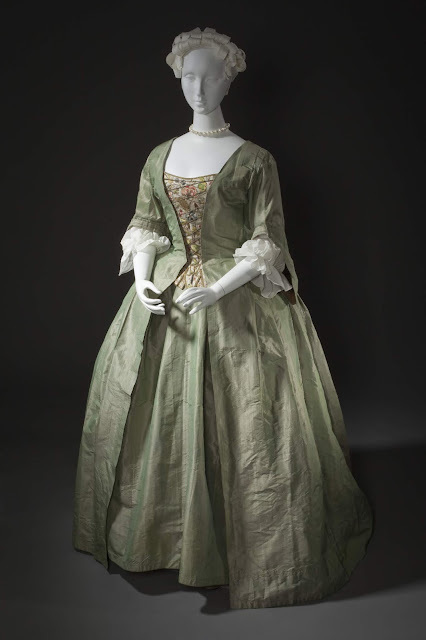 However, notice that the robings and stomacher are allowed to bend -- either the mannequin has a shorter than wanted waist, or the severe line is beginning to change to a rounder, shorter one. The way this dress is mounted on the mannequin, it is hard to tell how the dress should actually sit. The waistline appears natural, and the dress has a more pronounced vee shape than I would expect from paintings of the period. Furthermore, the stomacher is allowed to curve out on the belly. Here is a detail from the same dress, focusing on the embroidered stomacher. 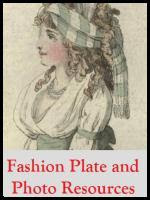 If you have read Patterns of Fashion 5, you will have seen examples of the tabs (known in the book as skirts) and the spade-shaped front point, which mimics the points of early stays. I might well be in error, but I'd wager that as originally worn, the stomacher followed the line of a longer-fronted pair of stays, so that they did not bend at the waistline, or bent barely at all. An old photograph, styled differently than we might do today the lines of this dress still seem quite clear to me. The stomacher area is narrow, given the narrowness of the ribbon echelle. In this mounting the echelle curves out towards the front a bit at the bottom. Once again I would think that when the dress was first worn, the stays would have been rather long, and bowed down the front, coming to a narrow point covered by the last bow in the echelle. This would throw the echelle and the entire torso into greater relief, and make the waistline appear narrower than it already is. Mountings similar to the above are common throughout museums. It is not my place to criticize them. I worked at the Metropolitan (in Membership, typing up ledgers for a living) for a few years just after of college, and remember that even then, in the age of blockbuster exhibitions and fabulous expansions, money was an issue. Today the situation is even tighter in many places, and the prospect of tweaking underpinnings to match the projected stays style under each dress mounted would be quite a project. Now, outdoors to sort Nina's new fleece so I can send it and several others to the mill to be made to roving! Nina, a year or so ago, in full fleece, playing corn dog. 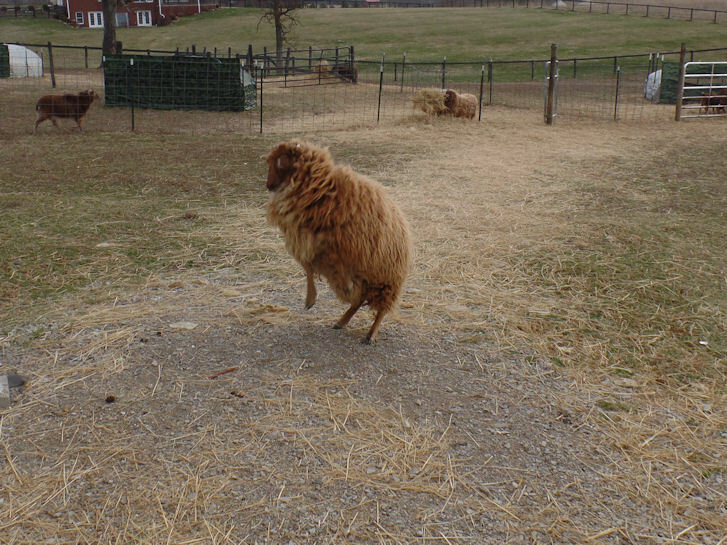 Actually, she is feeling very Soay sheep-ish, and so all frisky and fluttery. Okay, her fleece may flutter. Flying corn dogs don't. Eh, what's that? Am I writing again? Nutmeg, who joined us later in 2016. Yes, essaying, anyhow, to see how it goes. Sometimes I've missed writing in the way I suspect a runner misses running, longing for the exhilaration after a good workout, but relieved that the joints aren't hurting or there's no longer the inevitability of having to push past the ragged breath and throbbing muscles in the middle of a long, evil hill. 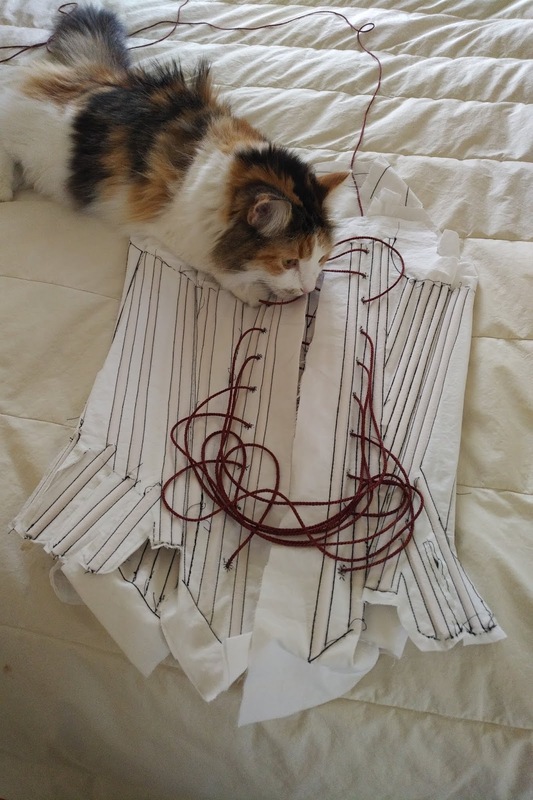 At other points, I was fairly sure that making costumes and blogging about the research and construction behind them were part of a past life, finished, and viewed the way you do when you think about a job you held once, that you enjoyed, before you switched gears and went off in a different direction. That job and its lingo and concerns were, as months passed, experiences you didn't quite understand anymore. Last I wrote, I was still struggling with a dress inspired by a Vernet plate, and my kitty muse Miss Blueberry Muffin had passed away. The twins were growing fast and were huggable when I could catch them, work was bloody nuts. Usually work is something I enjoy, or it's nuts in a good way, but I have attempted to bury 2016-2017 deeeep, because it plumb wore me out. Tired -- dog, bone, dead, done tired out, sapped by migraines and digestive problems that meant an interesting diet of Ensure for breakfast, Ensure and bread for lunch, Ensure and oyster crackers for dinner. Doctor's visits, new medications, and if I saw a set of stairs, I'd mentally steel myself to make it halfway up a flight before having to stop. To breathe. I gave up carrying laundry baskets. Ooh, I'd like to do that again, but that's not fair dinkum to the family, is it? 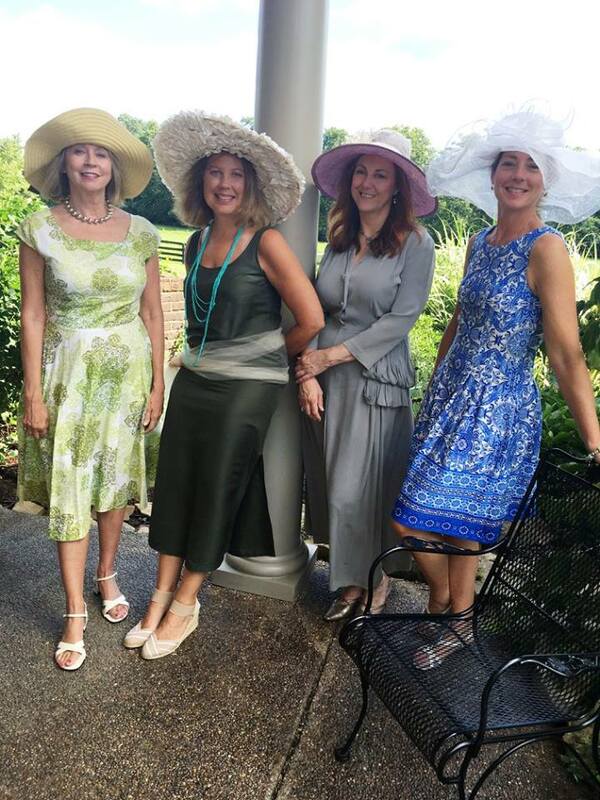 In a happy moment with friends at a wedding shower. So I just stopped. Costuming. Blogging. I said goodbye to Facebook, to where it seemed the whole of the planet was flocking anyway, but where I began to feel like quite a stranger, on my own feed. But let's walk away from that cultural and ethically challenged meadow -- morass -- swamp -- Dead Marshes where are lit little candles to entice the unwary. By the way, if you have a 10-year-old boy and together you say "swammmmp", drawn out, in your deepest voice, like a bullfrog, and repeatedly, it's hilarious. Christopher and I croaked "swammmmp" on the Amtrak train from Richmond to Washington, DC, each time the view out the train window went wet or reedy, and laughed until tears were running down my face. His brother wasn't impressed and returned to Rick Riordan. Life's focus became living with most of the frills removed. All those with chronic illness might be smiling wanly in recognition. I salute us, get-through-each-day warriors all. Do you like skiing? Snow-skiing, as we say here in the South, to differentiate it from flying over glass-smooth water or wavetops behind a motorboat. I love both, but especially skiing on snow. It's speed, it's exhilaration, it's the shssss sound of carving a minute groove into groomed powder, it's more speed, and hot chocolate with your family and your friends in your clomping snow boats and undone snow jacket afterwards, red-faced and thoroughly happy. January 6, 2018, we took the boys skiing to our local ski bump, a north-facing bluff in a valley off the Ohio River. And there I crossed a Rubicon, on a cloudless day, about 24 degrees Fahrenheit, on a green slope -- no, it was a bunny slope -- where my husband and I were re-introducing the boys to moving downhill on waxed boards. As the surgeon's resident said later, it was a classic wishboning. Gee, that's raw, but that's what happened to both knees. My son Noah forgot how to snowplow, forgot how to stop, and at one mile an hour ran into me and we both spilled into the snow. He fought his way upright, and I did the same, though even less elegantly, but there was a slope in front of both skis, but what I didn't see -- a slope leaning off to the left. Slowly, so slowly, the two skis went their separate ways and --. End of description: it just wasn't fun, although it was so cold that it nothing hurt after the initial fall, even when bundled into the emergency sled by the Ski Patrol, joking all the while out of nerves and embarrassment. Well, don't ski when you've been existing on poor food and less exercise for several years. It's like the guy with heart disease who thinks he can shovel a driveway after a 10-inch snowfall, no problem. it does record the fateful date. I tore both knees up, but one worse than the other, and had it rebuilt, and tired my blessedly patient and kind-hearted family out with caring for someone in a wheelchair and then crutches for what seemed ever, and spent nine happy -- yes, happy! -- months in physical therapy. It all hurt like billy-oh, because physical therapy is supposed to push you to use the injured limb(s) again. It did more than that: it pushed me back together, and now I've got my mojo back. Like way back. There are wrinkles on my face, and the upper arms aren't firm like they are in old photos from 15 years ago, alas, but I'm back at the gym like I used to be long before costuming was even a term I'd heard of. Not exactly a gym rat anymore, but a middle-aged gym buff, happy once again at the weights and the machinery that mimics walking and stair-climbing and arcing, whatever that is :} And I can eat. Which is why I am not slender. Trying to be more so, but that's a work in progress. Liam, his girlfriend Lana, and daughter Nina at my friend Sarah's farm. 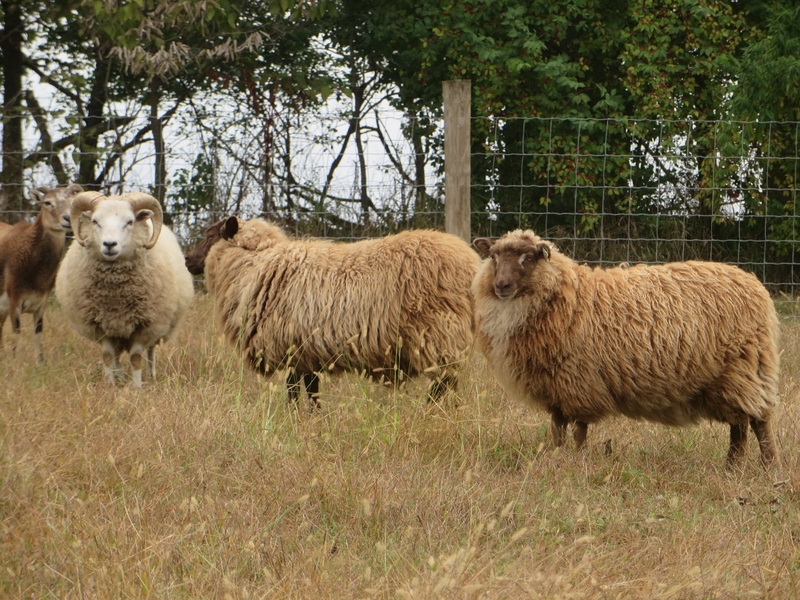 Liam is the patriarch Shetland wether. With improving health, returned the urge to make things. 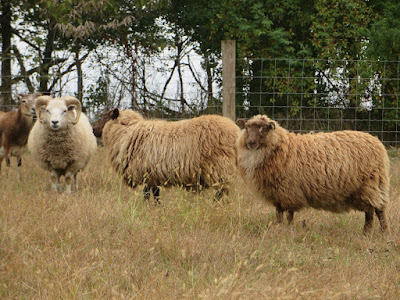 I've been spinning wool for some years, as the whim takes, and have multiply fleeces from Lana and Nina, our sheep, waiting to become yarn: they can grow a fleece faster than I can spin it, by many a long mile. I should, by rights, be wedded to the spinning wheel. However, some of you have been blogging all along, and some have returned from what appears to be a general 2016 exodus, and I've been enjoying reading about what you all make, and enjoying the videos that some of you have posted. You and your experiences and your wit and laughs, and researches, have been such a delight. Am rejoining you, and now there are two projects en train. First, a pair of late 1750s stays. 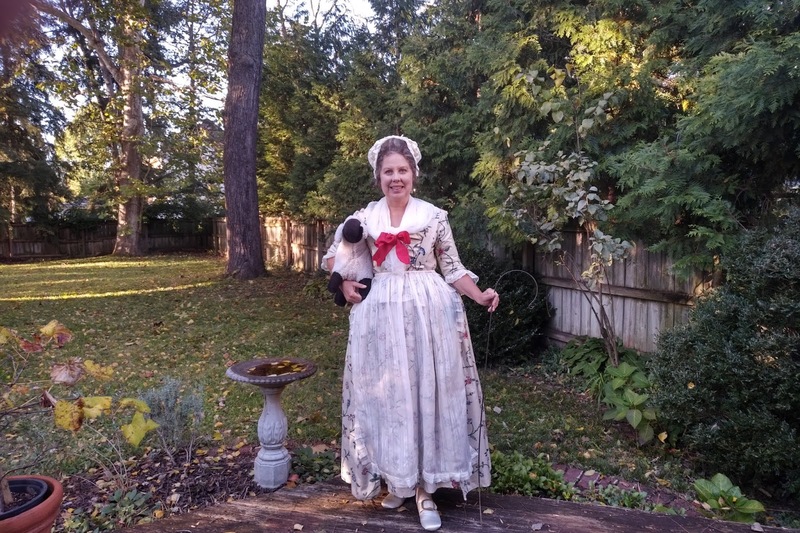 My 1770s stays are perfectly serviceable, thanks to the solid job Sarah of Romantic History did on them years ago, but a longer pair of stays would offer a more long-waisted, more slender look. Like many of you, I have a copy of Patterns of Fashion 5, and spent almost a week examining the graphed examples and the many fantastic photos of the exteriors and interiors of the stays included in the book. 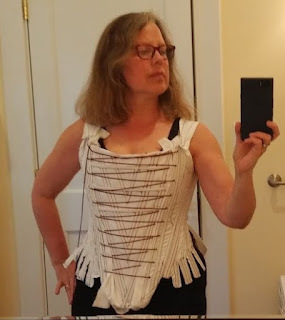 Fascinated by the truly conical stays, and how so many feature a built-up front of layers of buckram, I plumbed the Web for detailed portraits, and noticed how the bottoms of many bodices, and stomachers, appear like the bottom of an ice cream cone, if it were cut in half. How the front dipped very low, and rose up with to the side of the hips quite dramatically. Usually these portraits were of women in either their best clothes, or wealthy undress. 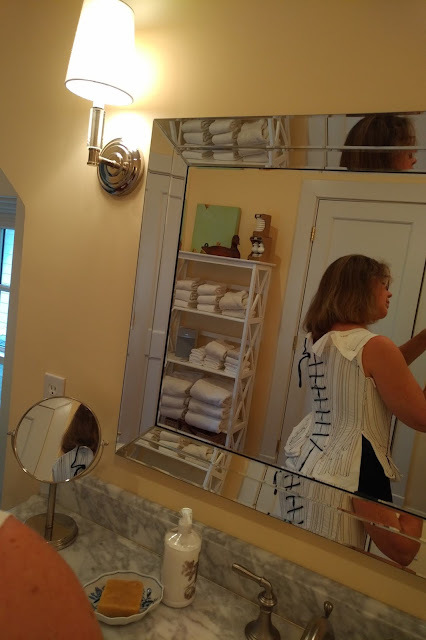 It occurred to me that my own silhouette might be improved by mimicking that longer line with a pair of high-fashion stays, low front, thrown-back shoulders and all. So, you'll be hearing about them. I've completed a boned mockup and am ready to try it on. 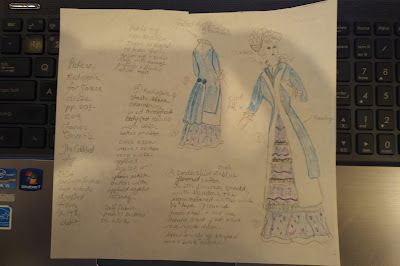 1880 summer dress plan. Limited artistic talent on display. You can blame Frances Grimble for that one. Periodically I pull out her books and re-skim them. 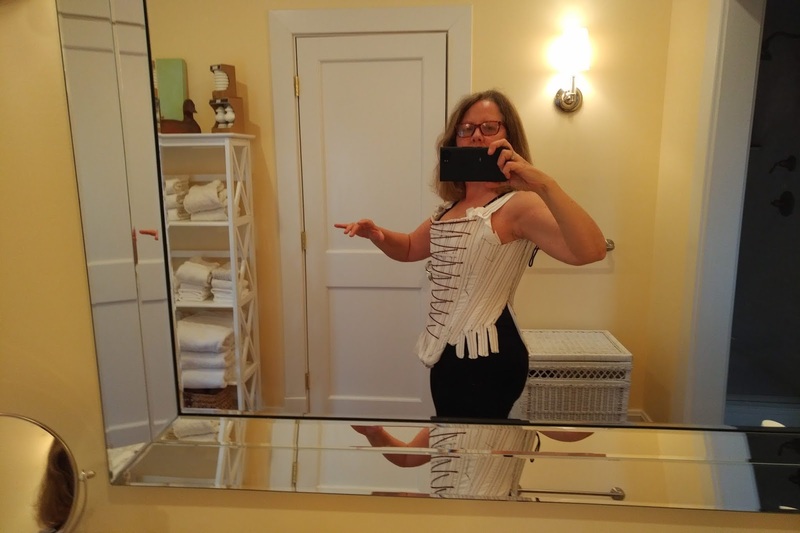 The 1870 steampunk dress was fun to wear, though it needs a renovation with bodice boning, hooks between skirt and bodice, and additional trims, and this time I won't wear my corset upside down. However, it's not a dress to picnic in. Wouldn't it be nice to have a lightweight non-bustled dress one could flop down in onto a boulder or blanket for a picnic with friends? Thus we have a new Kay Gnagey 1876 corset on order, and all the materials ready for a cotton chambray princess-seamed redingote and flounced skirt outfit, patterned from a Harper's Bazar pattern in Frances Grimble's Fashions of the Gilded Age, Volume 1. More on that dress later. Sparkling, lapping, plashing, spilling, mirroring, roaring, I love everything about water except undertows, thunderstorms, and monster waves, and have done since I was so young that memories are like spotty, split-second vignettes. I grew up around water, in it, beside it, along it, sometimes under it, and especially on it. Canoeing, rafting, motorboating, rowing crew, and, love of all water loves, sailing. 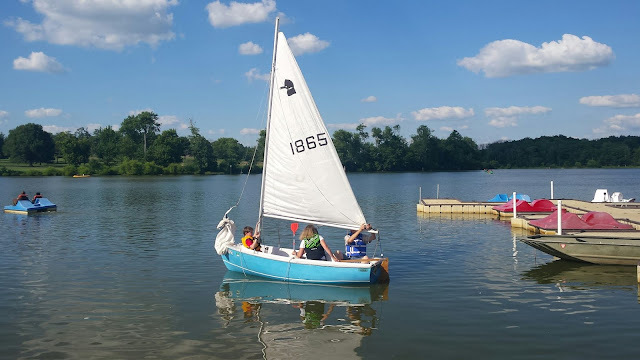 Our daddy took us out on his little Sunfish lookalike on sunny afternoons, and our aunts and uncles and cousins were Navy people and/or spent their leisure time racing or on pocket cruisers and weekend outings on the Chesapeake and Lake Ontario and off the Florida coast. Yet here was our family, plop smack on the sea of grass that is the Kentucky Bluegrass. Years passed and I despaired of doing other than walking and fossiling alongside Kentucky streams plppp plppp plipping in that bewitching way they have, a wary eye out for copperhead snakes, mud, and the gnawed bones left occasionally left by coyotes. Until last year. The Kingfisher is my version of the 55-year-old man's Corvette or Mini Cooper with racing stripes. It's another player in the multi-roped tug-of-warm among costuming and spinning and running around with Curte and the twins. It's the fulfillment of the promise I made to myself to Get Up and Live Anyway after so many years of ill health. Setting sail, Christopher in the bow, and Noah handling the mainsheet. It's the miniature version of the classic tale titled "Boat: a Hole Into Which You Pour Money". 12 feet long, 45 years old and needing work, of course -- so rather a "bargain". High-prowed because it was meant partly as a yacht tender in big waters, with close, familiar, okay tight, seating for four, and a tall mast capable carrying two sails to pull her fast over our local lake. Oh come on, Jacobson Park Lake is really a gargantuan pond, but it's pretty and it's just big enough, and there's Cave Run Lake like a coiling dragon among the Knobs just an hour away. Let's set sail again, then, hey? Let's explore those stays and how they fit, or don't, and how I will wrangle 6-inch-wide eyelet onto the curves of a redingote, and let's feel breezes on our faces, and hear fsshhh-flssshh of the Kingfisher cleaving the prow of our trusty craft. Let's visit the flock and hear them rrrip, munch grass and listen to Mira the Soay complain ba-ba-ba that all crunchy treats are for her alone, everyone else get off, get away. I can't promise to write regularly, but let's give it a try again, shall we? I've missed you.